KCT 2 roller conveyor tracks are manufactured using mild steel conveyor frames. In addition to the steel conveyor rollers offered within the KCT 2 range, a lighter duty version is available with plastic conveyor rollers. Although a slimline roller track, the KCT 2 roller conveyor still meets the high standards of all KBR Machinery's manufactured gravity conveyors. The KCT 2 metal roller conveyor thereby remains a robust, solid and reliable warehouse conveyor. The KCT 2 steel roller conveyor frame can be supplied in one of 3 standard colours, RAL5002 Ultramarine Blue, RAL 9010 Pure White, RAL 9005 Jet Black . In addition to the standard colour range, custom powder coated colours are available, together with 304 stainless conveyor roller frames for example can be manufactured for food conveyor applications. KCT 2 roller conveyors also incorporate spring loaded steel conveyor rollers, thus speeding up conveyor maintenance and cleaning of equipment. The KCT 2 metal conveyor rollers give the results of heavy duty conveyor rollers, while allowing small packages to travel along the conveyor rollers in addition to larger and heavier products. Galvanised steel conveyor rollers are hydraulically pressed with heavy duty conveyor bearing housings, which contain steel ball races. As a result the pressed conveyor roller bearings and steel conveyor rollers in particular, provide excellent durability and wear within challenging and ever changing work environments. KCT 2 conveyor rollers offer a low point of inertia and medium rotation speed. The light to medium duty steel conveyor rollers, together with the close roller centres provided, subsequently means KCT 2 steel roller tracks are the perfect light - medium duty roller conveyor system. 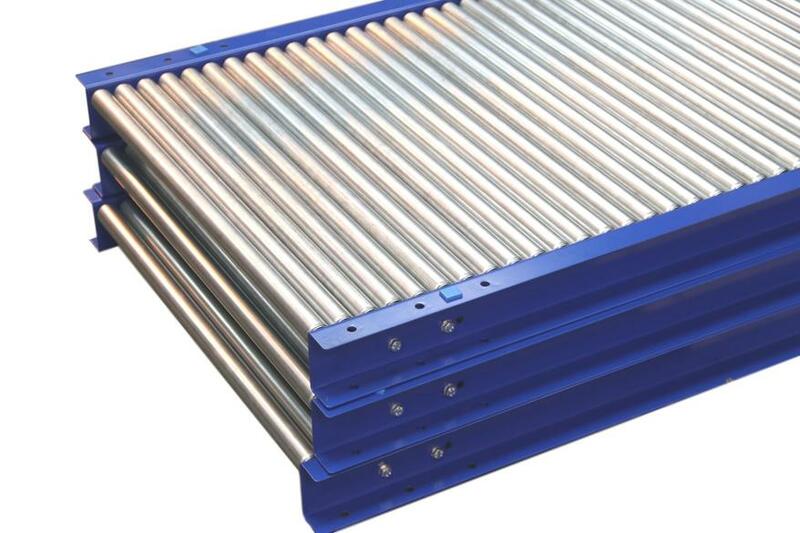 Ideal for small to medium roller conveyor systems, long spans and/or end of line accumulation. Where light - medium weight rollers and conveyors are required. Minimum product size 96mm and above. Conveyor length: 2400mm sections as standard. Roller centres: 32mm - 150mm. Spindle: 8mm round spring loaded. Bearings: Bright zinc plated housing with steel ball bearings. Frame: 2.5mm mild steel powder coated finish - Custom colours available on request. PLEASE NOTE: Product weight should not exceed the weight capacity for the conveyor rollers. Furthermore 30mm diameter steel roller tracks have a weight capacity of 30 kgs per roller at 300mm width. As a rule with every additional 100mm increment, the load capacity will decrease by 10%.